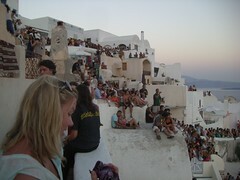 According to wikipedia the sunset at Oia, Santorini, is reputedly one of the most beautiful sunsets in the world. As the evening sets in bus-loads of tourists seek viewpoints in the small hillside town. Definitely a place for sociable people. This scribble was published on Friday, August 29th, 2008. You can follow any banter on this scribble with the RSS 2.0 feed. You can share your inspired musings after typing the anti spam word near the bottom of the page. But no Pinging because its too naughty.